When I was in high school I was invited to join the Order of the Rainbow for Girls. This is a secret society for teenage girls, an offshoot of Master Masons and Eastern Star. Socially awkward and on the lower end of the economic scale in my school, I was thrilled to join this society that I viewed as elite and prestigious. At one point, I was asked to participate in blackballing another girl in our school, the reason being, “she’s not like us.” She lived in the trailer park. Wanting desperately to be accepted, I agreed. I have never stopped regretting my part in this mean-spirited action. There was much debate among early Christians about the role of circumcision as requisite for salvation. Since Gentiles were not circumcised, they were considered unworthy of becoming Christians, at least not without submitting to this Jewish ritual. They were “not like us” to the Jewish Christians. But God does not make those distinctions. Jesus came to offer salvation to all, Jew and Gentile alike. 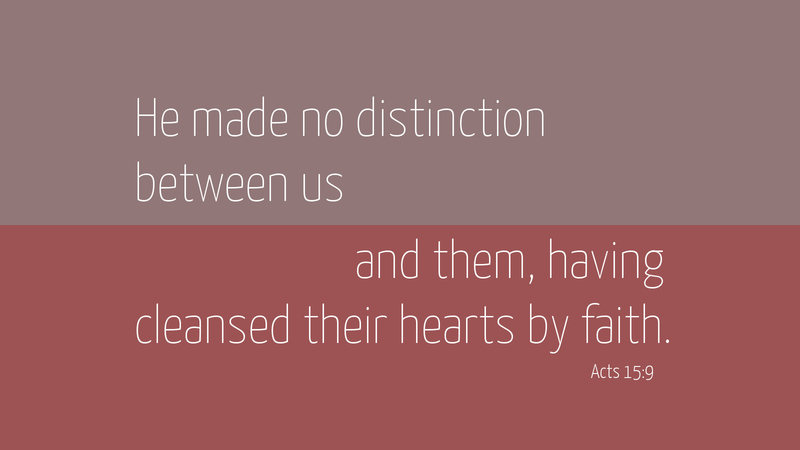 In the Great Commission, he charged the disciples — and us — to go and make disciples of all nations. What a blessing to know that God accepts every one of us, just as we are! Prayer: Dear Lord, help me never to give in to the desire to claim my own “worthiness” in superiority over others, but to reach out to all as you call us to do. Amen. I never liked the “categorizing” of people, even in high school. Being very average myself, I would try to shield others from harm. God shields us today, even if we don’t see it or realize it. Putting our trust in mankind can be risky business with the human elements involved.